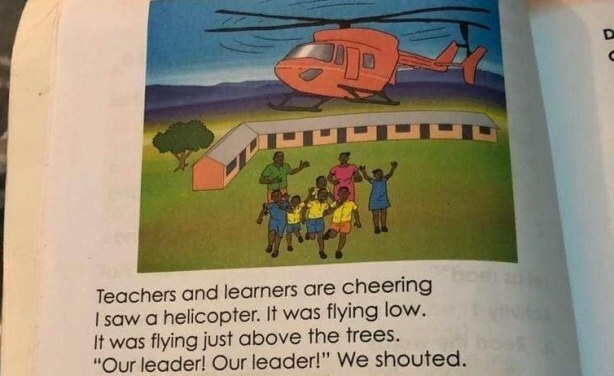 Isn't This Helicopter Illustration in Kenyan Grade 2 Books Weird? Kenya Publishers Association has defended the flashy illustration that portrays a flamboyant MP's visit to a school. Part of the caption reads, "Teachers and learners are cheering. I saw a helicopter. It was flying low. It was flying just above the trees. 'Our leader! Our leader!' we shouted. It was our Member of Parliament. He travels in a plane. It belongs to him. The helicopter landed in our school playground. Three big cars arrived in our compound. They too belonged to him..."
Page from Grade 2 textbook in Kenya.